There have been a number of posts I’ve seen pop up this week on various fora about how this is the tenth anniversary of the invasion of Iraq. Hopefully this thread will be more successful at avoiding the politics debate than the Falklands one, but the anniversary is one of the triggers for this thought. It has certainly been a while. I am not sure I took it too well when I got a note from my old platoon sergeant saying “hey, our ten year reunion is later this year.” As if the grey hairs weren’t bad enough reminder of my advancing age. What is probably of more interest, however, is how armour, and tanks specifically, have adjusted to the current fight. Ten years ago we had the desert engagements, and the famous Thunder Run. The tanks did great. Then, the opposition melted, and we started dealing with small-scale engagements against small groups of people armed with light weapons. Not suitable for tanks, apparently. Indeed, when my company showed up, we had brought more tanks with us than the entire 1st Infantry Division did. It wasn’t a tank war. I have a couple of problems with these thoughts. Firstly, relevant to what? So what if tanks aren’t relevant to the current fight? They’re relevant to what happened ten years ago to get us to where we are now. Sure, there’s the comment that “Nobody would ever be stupid enough to engage us in another high-intensity conflict, the days of tank warfare with the US Army are done.” But that’s because we have such a good armour force that it is the deterrent from doing this to begin with. Get rid of the tanks, and what happens then? Then there’s the perception that tanks aren’t relevant in the current fight anyway, and that Armor Branch are just trying desperately to shove the square peg of a 70-ton MBT into the round hole of the counter-insurgency role. Failure to learn from others. The idea of using MBTs in peacekeeping certainly isn’t new. Pakistani M48s (No, not M60s as in the movie) were used in Somalia. Indian T-72s were there too. When the unpleasantness in Yugoslavia started, the intervention forces from countries such as Denmark and Germany brought their Leopards, the UK brought Challengers. Leopards again found early use in Afghanistan. There is something to be said for the idea of something really tough to kill which can kill you easily. Certainly modifications had to be added to doctrine, the environment creating unanticipated technological challenges. The Danes started putting coaxial spotlights on their tanks in former Yugoslavia. Who would have thought that we would be going back to obsolete technology? White light spotlights went the way of the dodo in new tank design in the 1960s. The whole point of the technology was to be able to see and kill without the enemy even knowing where you were. But in peacekeeping, or peace enforcement, deterrence has a value of its own, and deterrence only works if the other guy is deterred: The Leopard tracking the approaching trouble with the thermal imager is all well and good, but won’t warn the approachers. Flip the switch for the spotlight though once you’re aimed at them, and that sends a very clear message…. Another annoyance of the modern battlefield which caused technological problems was the fact that when today’s modern tanks were designed, there was something of an assumption that people would turn out their lights. One would not be driving down a highway in a combat situation sharing the road with oncoming traffic which has its high-beams on. If your primary driver’s and commander’s vision system is image intensification, it doesn’t take much imagination to see the problem. The tank has to stop. (Or worse, as in my case, we went off a cliff. Yeah, that was a lesson learned). And engagements against a lit city skyline are a serious problem. Not sure if that is why the driver’s vision has been replaced by thermal imaging now, but it certainly helps. But we were learning this as we went. There were certain ‘fundamental truths’ which we knew when we started which we then rethought. Firstly, simply the utility of the tank in patrolling. We would run with a track on the soft shoulder in the hope of detonating mines. Tank would be immobilized, and we’d have to spend some time fixing it, but better the tank hit it than a HMMWV. (This was back in the days when our two HMMWVs had steel plate bolted to them), and quite handy when a Route Clearing Package isn’t around. We actually had a very boring tour, after the first week when the opposition realized that we were bringing tanks along, they proved not to be so stupid as to deliberately engage us. The noise of the tracks could be heard coming from some distance away, so much like the siren of a police car, once the opposition figured out we were coming, they’d break contact before our arrival. Lots of happy infantrymen for our having stopped the fight, but we never got to even see the opposition, let alone engage them. As a general rule, wherever we went, it was quiet. Tanks are great at peacekeeping! Eventually we were relocated to Mosul and attached to a Stryker unit up there, which wanted something a bit meaner than an 8x8 truck. As a tanker, I was not particularly happy about this. I was well versed with the concept that tanks and cities tend not to mix. How foolish I was, and how easily I was willing to disregard decades of experience on the subject learned by others. Of course tanks are useful in cities: They provide exactly the same advantages in the city as they do in the open. Their vulnerabilities are emphasized differently, but their advantages are the same. Eventually we came to realize this, and had a most pleasant time commuting around in the tanks. 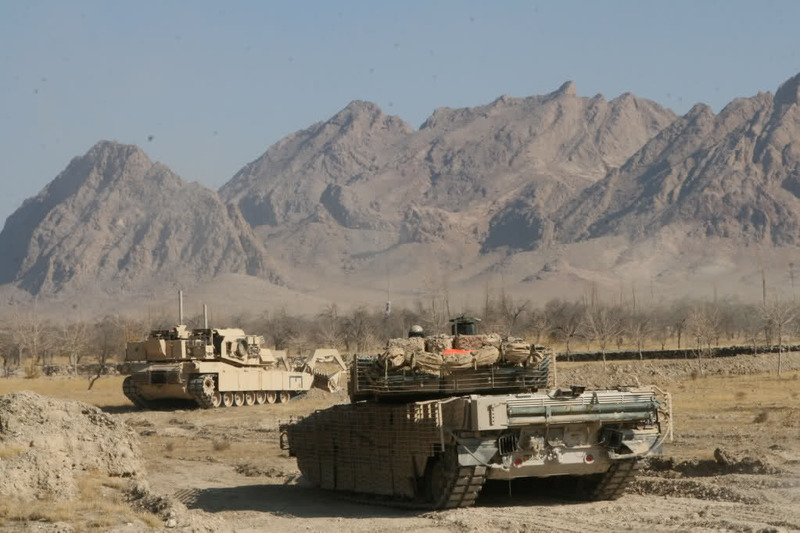 Nowadays, as noted elsewhere, the Marines finally decided to bring their M1 tanks to Afghanistan with them, in similar areas to those which the Danes and Canadians have been using their Leopards for years. Where is this lack of relevance that people are worried about? The tanks are relevant in high intensity warfare, they’re relevant in low intensity warfare. No other system currently has the combination of firepower, armour and staying power that a tank does, all three assets are useful in whatever fight one finds themselves in. I’ve never had anyone come to me in the past and say “Gee, nice of you to show up with your tank platoon, but I really wish you had brought M-ATVs or Strykers”. Not dissing the Stryker lads, they have their purposes, but a tank’s job isn’t one of them. The question of relevance isn’t tactical. It’s political. And I hate that.